With the almost springlike weather of the last few days it's easy to forget that it was February when we experienced -30 degree weather last year. It isn't time to put away our winter clothing yet! One of the most requested items last winter (and earlier this winter) was warm gloves that still allowed contact with the reins when riding. 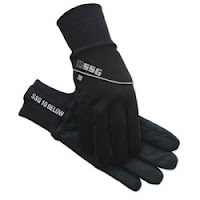 We've found four good winter gloves from SSG in Canada - where they surely know what it is like to ride in the cold. The first is the lined Work N Horse. Riders love the flexibility of this glove. It's made with pliable leather and lined with Thinsulate for warmth without bulk. One of its best features is the dome fastener cinch at the wrist. These are warm, pliable, don't get stiff when wet and are the most economical at $21.95. We carry them in dark brown and sizes 6-11. 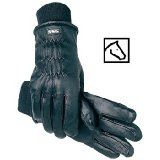 Our best selling glove this year is the 10 Below Equestrian. This glove is constructed like a ski glove with a thin palm for riding. It offers complete waterproof protection (not just water resistant). It has a Thinsulate and polar fleece lining and (one of it's best features) a knit cuff which really holds in the warmth. The 10 Below is black with a reflective strip. We carry all sizes from 6-12 and it costs $29.95. Image is not available for black. 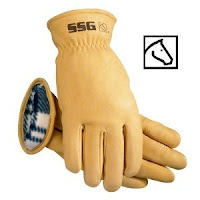 Another popular glove, with both the riding and non-riding crowd is the polar fleece lined Winter Rancher. This glove is made from soft but tough North American deerskin, lined with polar fleece and has an elasticized wrist. There are no finger seams on the palm side of the winter rancher and they are incredibly comfortable and look good enough to wear as a driving glove with street clothes. We stock them in black in sizes 6-11. The winter rancher costs $36.00. SSG Style Winter Training Glove. The last glove is the most expensive, but very warm. 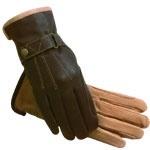 The Winter Training Glove is made from drum dyed goatskin leather for wear and grip. It's lined with Thinsulate plus a layer of polar fleece and has a knitted cuff to keep out the cold. It comes in black and costs $39.95. We stock sizes 7-12. These gloves look so comfy and perfect for winters. These type of gloves are the prefered one because of its fine quality. These are reasonable too.